Tune in to our Football Manager player attribute guide, where we will give you the definitions to all key attributes and how they affects various parts of the game, especially in regard to the match engine, but also when setting up player instructions. In the previous version of Football Manager the individual training was revamped, this year the match engine has seen an complete overhaul. We’ve been introduced to 8 new player roles in FM14. Understanding how the different player attributes affects your tactic through-out the match engine has never been as important as now. As you will discover when playing Football Manager 2014, the player attributes affects the overall success of your tactic and each players’ attributes should be evaluated when creating your tactic or determining your preferred playing style. Raising your knowledge about how the different player attributes affects a player’s performance, on it’s own or in cooperation with other attributes might be the difference between a quality FM14 tactic, or an average one. As mentioned briefly above, all the relative attributes can be increased through training and player development, and will be the main working area when improving players through general or individual training. Understanding how the different attributes are tied to the on-pitch behavior and their specific player role will be important for creating a successful tactic. Player attributes will be the primarily element to influence, when developing players. It is worthy to understand what each specific attribute mean for the players’ performances according to their preferred player role and duty. You can read more about Football Manager Training here. In Football Manager 2014 there are three different kinds of player attribute categories; Technical, Mental and Physical, which we will discuss in detail below. The technical attributes are the most important playing attributes, which affects how well the players are doing in the matches in terms of being in possession of the ball or retaining it. Of course will all players require mental and physical skills in order to perform successfully, but the players technical skills will be the main tool to separate good players from bad, from general average performances to superb. Higher ratings in this category will most often mean better performances on the pitch. There are 14 technical player attributes in Football Manager. Corners This attribute predicts a players level of accuracy when taking corners. A good corner taker is always able to set the ball into key areas and will need good technique and crossing in order to pull it off. Tied to a players preferred foot. Leighton Baines and Juan Fernando Quintero is two players who can both cross and take corners. Crossing will be an important attribute for all wide players, such as wingers and fullbacks, or for corner takers as mentioned above. The crossing attribute will affects a players proficiency at crossing the ball from wide into the penalty box in regard to the two types of crosses; drill or float. He will need good anticipation in order to understand player movement in order to make a successful cross. Free Kick Taking determines a players level of quality in taking free-kicks, which will be valuable no matter playing style or squad you possess. This attribute applies to both direct shots, wide and deep free-kicks. Good direct free-kick takers has also good finishing, while free-kicks from wide will require decent level of crossing. No matter type of free-kick, a good free-kick taker will need excellent technique in order to pull it off. Think of players like Andrea Pirlo, Xavi and Robin van Persie who also has the required composure and creativity. Long Throws determines a players ability to take long throws. A suitable long thrower will require decent strength, as this factor will also determine how long he will be able to throw the ball. A good player for taking long throws will be Vedran Corluka. Penalty Takers This attribute determines a players ability to be confident from the penality spot. He will require both good finishing, technique and composure, but also excellent concentration and decision in order to be successful from the 12 yard line. A players mental state of mind during match should be considered as well for example before a penalty shoot out. Dribbling refers to a players ability to dribble with the ball and is only proficient when he has the ball at his feet. An excellent dribbler requires also good balance and agility, while pace and acceleration might be worthy as well in order to dribble past their markers, as the dribbling attribute alone will not make him get by. First Touch In the modern world of football, this attribute has become one of the most important attributes in order keep possession of the ball and take advantage of it. This refers to a players ability to get control of the ball and put it into a useful position no matter the amount of pressure from opposite players. A player with poor first touch is more likely to loose the ball when closed down quickly. First touches are not defined as bounces off, such as headings. First touch will be the primary attribute for sweeper keepers. Heading refers to a players ability to head the ball in all aerial situations. A good header will need the height or jumping reach in order to be able to head the ball. Secondly when he’s superb in the air, he will require decent strength in order to head the ball over a specific distance. A tall player might be able to head the ball in aerial situations, but will also need good heading and anticipation to take advantage of his height and head it more accurately. Having tall players with good jumping reach and heading will be worthy in any set-piece situations. It is as vital for your defenders as your forward(s), both in order to defend and attack. Passing is a players ability to pass the ball. For a better accuracy over longer distances a good passer will also need decent technique and balance. This don’t mean that a player with low passing will have low passing accuracy if passing short. A good passer will also require good anticipation and decision, but also some creativity in order to connect to his teammates. Having players with good passing will be worthy no matter their positioning and role, but is most vital for midfielders; playmakers. Technique is the main attribute for all sorts of general football skills. In Football Manager it is referred to a players aesthetic quality to pass the ball, shoot, cross, or how refined a player will be with the ball. A player with excellent technical abilities will be more likely to succeed at pulling off a tricky pass or cross-field balls with greater ease than a less technical player. Finishing A players ability to put the ball in back of the net when presented a chance. Higher attribute increases a players chances to put the shot on target several times compared to a player with low finishing. A good finisher will spot the places where the goalkeeper can’t save the shot and refers to a players finishing accuracy. A good finisher will also need excellent decision and composure in order to score consistently. This attribute is most important for your strikers or inside forwards, but can also be profitable for attacking midfielders who are present in the box when attacking. Long Shots is one of few stand-alone attributes. It predicts a players ability to shoot from distance; outside the penalty area. Long shots will require decent technique and finishing, but is also aided by decent decision and strength. A good long shotter is often required for one of your midfielders, but may be proficient for inside forwards and deep-lying forwards. Be aware of any player preferred moves in this department, such as “tries first time shots” or “shoots with power”. Player like Paul Pogba and Gareth Bale is both known for their great long shots. A good attacking line will also require creativity, off the ball and composure. Marking refers to a players ability to mark an opposite player. It’s mainly an defensive attribute which predicts how well he is capable of marking. A good marker will also need strength, anticipation and off the ball in order to move according to the opposite player, visualize his movement and refrain the opposite player to get possession of the ball, or take advantage of it. The efficiency of marking is also tied to the two players comparable physical stature, as a stronger or quicker player will better move off his marker. Tackling attribute determines how well the player will be at winning the ball cleanly without conceding fouls. It is primarily a defensive attribute as is one of the key attributes for retaining possession, and is required for all defenders and defensive midfielders. A good tackler will also need great positioning and decision in order to put in the right tackle at the right time. In additional to these two main defensive player attributes are concentration, heading, positioning and anticipation required to have a great defensive line. All managers would like mentally strong players, who have the ability to be determined and have a hunger for success. While the technical attributes discussed above is important for general player performance, the mental attributes is most important on your road to success. You will want professional players who are always looking to develop and improve, who can lead their team mates and are committed to the team strategy; works for the team and team success. 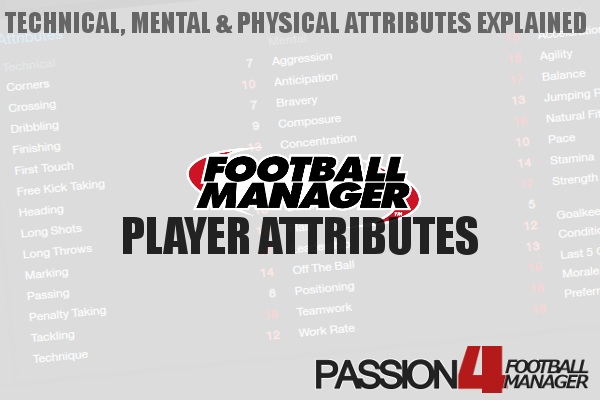 There are 14 mental attributes in Football Manager 2014. Creativity refers to a players vision; to see a potential opening. The player will not necessarily exploit the opening, but will have the advantage to see potential chances, which someone with less creativity don’t. A player with high creativity will also require great technique and other technical attributes in order to pull it off. Flair is solely a players ability to do the unpredicted and use his creativity in an attacking outlet. A player with much flair can both be a great attacking player to possess in all teams, but will require tactical restraints in order to take advantage of him, as he often may try to pull off some excellent movements and tricks. The mainly attacking flair attribute is tied to creativity and decisions. Mesut Özil is one player with excellent flair and creativity in FM14. Off the ball can be described as a players movement off the ball; how well an attacking player can access a situation and then move off the ball making them available to receive a pass in a more dangerous position. Off the ball is one of the main attributes when choosing player instructions “Move into Channels” or for player preferred moves “Play One-Twos”. A player with good off the ball will also require decision, anticipation and acceleration to pick the right movements at the right time. shy away from situations and drop into his comfort zones, waiting for the play to find him. This attribute is not a dirtiness factor at all, but will be important for playing styles with much pressure and closing down. Bravery is mainly about how committed the player is. Braver players will risk injuries in situations where lesser minded will shy away from. Carles Puyol is an example of a player with much bravery, a player who will go all in in every situation and lay the line for the team. A brave player will also need aggression and determination to go all in, in the right situations. Determination is the real deal for mentally strong players and predicts a players commitment for success. He will do whatever he can in order to win and will use his determination and bravery to succeed for the team. Player attribute determination is one of the most important single attributes for any players. Determined players will also have a hunger to improve himself and may be more inclined to develop faster with the right training and personality. Players with lo determination will most often react more negative when going one down. Leadership refers to a players ability to influence on the team and affect events or players without any intentional effort. A player with high leadership will be influential and team mates will rally around them. It is one of the primarily attributes for a good captain and is normally a mentally strong player. Teamwork refers to how well a player follows tactical instructions and work for the team. Many players with high ratings of teamwork will equal good team unity. A player with much team work is more able to co-operate with fellow teammates and staff. Many players with low team work will most often slack off and not “buy in” to the team ethos. Work Rate determines a players mental drive to work hard. A hard working player will work his socks off through out the entire time when on-pitch. He will work for the team but will require stamina and natural fitness to work hard throughout the entire match. Players with excellent team work and bravery may be the difference between an great and average squad. Anticipation is the most important attribute for a football player together with decisions. Anticipation refers to a players ability to have a vision of the unfolding events and predicts what will happen and react upon it. A player with excellent anticipation will read the game better and react quicker to unfolding events. This tactical attribute is also linked to off the ball and positioning. Composure is not only a players ability to keep a cool head in stressful situations, but also his steadiness of mind and ability, particularly when being in possession of the ball. A player with high composure will normally keep his head when presenting a high goalscoring chance, and put under a lot of pressure, and make an intelligent decision to the benefit of the team. This attribute will be important for your attacking line, but also for defenders who needs to stay calm when the opposite team is setting the team under heavy pressure, and make an intelligent decision to clear the ball or tackle. Concentration is vital for humans. In order to put in a good performance throughout the match the player will require high concentration. This attribute refers to a players concentration on an event-by-event basis, where players with high concentration will be able to concentrate better for a longer time and respond to incidents both as well early as late in the game. Players with low concentration is more likely to make mistakes at crucial times in the match. Decisions refers to a players ability to make correct decisions a majority of times. Similar to anticipation it’s an important attribute for all players, but most important for your defensive line and midfielders, who will have a lot of ball possession and have a number of decision options. A player with good decisions will also require good anticipation and concentration. This attribute is also important on its own, as it’s tied to decision-making in regard to movement (forward runs) and when to close down or not. Positioning refers to a players ability to read situations and position himself in the best possible manner to deal with the unfolding events. A player with high positioning will takes up a better positioning than one with less. A player good at positioning will also require anticipation and concentration in order to position himself better when in defensive situations. Players with better physical attributes can more easily fit into any squad rather than a player only strong in one of the areas covered above. A player with high physic will be more likely to play a competent game and won’t be embarrassed much, as he’s able to perform for a longer time. If the player also possess excellent skills in technical and mental attributes as well as good physical attributes, he can be considered as a world class player, as he is more likely to perform consistently in the modern world of football, where teams often play 2 to 3 matches a week. There are 8 different physical attributes, all important and influencing each other. Acceleration is a players ability to reach top speed (pace) from a standing start. Players with excellent acceleration and pace is more capable to take on his markers and move quickly around the pitch. Acceleration and pace is important for all wide players (wingers, wingbacks) but also other players who must change position quickly in an event-by-event basis, both off the ball and with the ball. Pace refers to a players top speed. A player with low acceleration but high pace can be quick, but will need longer time (and more space) to reach his full quickness. A players quickness is also determined by his stamina and natural fitness, which is decisive for how long time the player can keep top speed, both in terms of short bursts and over the course of the match. Players will always be a little quicker without the ball, than running with it. A quick player will also need good balance when running with the ball. Balance reflects a players ability to keep his balance in all situations both with and without the ball. It can be seen as a players stability when moving, turning and changing position. A player who is running with the ball will need good balance in order to stay on his feet and evade opponents when changing direction. Without the ball, the player will need good balance when running at opponents, turning or jumping. Agility reflects a players ability to start, stop and move in different directions at varying levels of speed. An agile player will need pace, acceleration and balance in order to move around quickly and start / stop for a various amount of times. Jumping Reach reflects how good a player is to reach the ball in air. It indicates the highest point an outfield player can reach with his head. A players height must also be taken into account when determine his jumping reach, as a tall player won’t require as high jumping reach as a shorter. This means that a player at around 170cm will struggle to compete against a player who are 20 to 30cm taller no matter his level of jumping reach. Of course isn’t the jumping reach reflective of a players height, as two players with same height and different jumping reach can differ in quality in aerial situations. Players good in the air will also need heading, balance and strength in order to get the ball before the opponent. Natural Fitness reflects how well the players fitness is and how good it stays when not training or when injured. It can be referred to a players level of fitness. A player with higher natural fitness is not only able to recover quicker from injuries, but is also more likely to be able to perform better for a higher amount of matches throughout the prolong season. Players with high natural fitness will also recover faster between matches, which will be an important attribute in the modern football. It also indicates how well the player retains his physical attributes as they go past their peak. A player with high fitness can also be aided by his stamina and strength. Stamina refers to how well a player can endure high-level physical activities for a longer period of time. Not only will the player perform at top level for a longer time throughout the season, but is more likely to loose less match fitness and don’t get tired out despite playing surface, such as soaking pitches. Natural fitness and stamina is close linked, and both indicates a players level of general fitness. Tireless players like Philip Lahm and Lars Bender are two prime examples of players who can endure 35+ matches a season. Strength reflects a players ability to exert his physical force on an opponent to his benefit. A player with a high strength will be able to use his strength to his advantage against weaker opponents. This attribute is important for players who are marking opposite players, but also for strikers who needs to use their strength in the air or at ground to get away of his marker.